This category is used for posts that talk more about the people, services, and operation of the archives as a department. 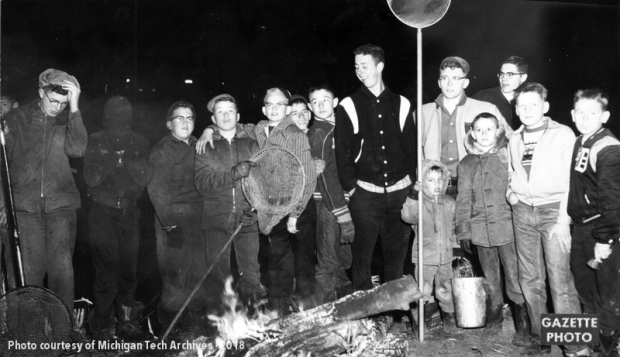 A group of happy smelt dippers near Chassell on April 19, 1958. Spring in the Copper Country means that–finally!–the snow begins to melt, the songbirds return, and the smelt begin to run. When we talk about smelting at the Michigan Tech Archives, usually we’re referring to the process of turning milled copper into ingots under high heat. Spring brings a different meaning, one that’s more fun and more than a little fishy. If you’ve lived around the Copper Country, odds are you’ve encountered a smelt or two, in the wild or on your plate. For the uninitiated, a smelt is a small fish about six to eight inches in length, though smelt elsewhere have been known to grow to more than two feet. The story goes that smelt were introduced into the St. Marys River downstate on four different occasions–unsuccessfully–as feed for sport salmon before someone stocked the inland Crystal Lake with them in 1912. It’s hard to find a small lake in Michigan that won’t connect with a Great Lake eventually. The smelt learned this as they traversed the waterways that led them to Lake Michigan, where they were first detected in 1923. 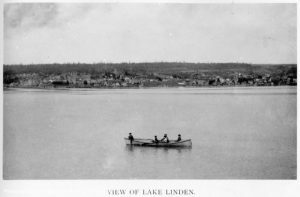 By 1925, they had traveled to Lake Huron and by 1929 to Lake Ontario. They wouldn’t make it to Lake Erie until 1932. In between, in 1930, smelt showed up in Lake Superior. For a time, the smelt population in the Lake Superior region remained fairly small. Though the first sport salmon struggled, other fish like lake trout found the smelt to be a tasty snack. As Sea Grant Minnesota explains, though, when invasive sea lampreys arrived in the Great Lakes, they went after the fish that had kept the smelt at bay. In classic predator-prey form, the number of smelt soared. Meanwhile, the burgeoning population of smelt contributed to the problem by feeding on the larvae of cisco, or lake herring, which were also food for the lake trout. As long as the trout remained at bay, the smelt could frolic freely in Lake Superior and the streams that fed her. Enterprising Chassell residents raised money for the Panthers sports teams by selling coffee, hot dogs, and sweets to the smelt dippers. These predator-prey-invasive species dynamics helped to create the phenomenon of smelting, or smelt dipping, in the Upper Peninsula. With the warming temperatures of spring, as Fred Hartshorn explained in his piece for the publication Copper Country Anthem, “the jelly in the egg sack of female smelt starts to break up, telling her she should start up stream to spawn.” This movement, known colloquially as running, occurs when the water hits about 38 degrees Fahrenheit, generally in April. Locals eager to take advantage of the running smelt have descended on streams with hand nets for decades and especially since the population spiked in the middle of the last century, making a fishing trip virtually guaranteed to be successful. For many years, it wasn’t uncommon to see smelting parties of hundreds of fishermen descending on places like Chassell’s Pike River, armed with nets and ready to catch buckets full of the little fish to sell or eat. Nowadays, the population of smelt is not nearly what it was in the heyday of smelt running, but people still flock to the streams in hopes of coming away with a bucket of the good stuff. According to the Michigan Department of Natural Resources, smelt season goes through May 31, so grab your net and your fishing license, and head on out while the weather is fine! The Copper Country has its icons: Lake Superior, the Quincy No. 2 shaft-rockhouse, the Portage Lake Lift Bridge, to name a few. Those with a passion for industrial heritage or a penchant for exploring might also point to a landmark on Torch Lake. On the shoreline of the mill town of Mason along M-26, a rusted and decaying hulk looms out of the water. This industrial dinosaur, out of commission for decades and now known simply as “the dredge,” once cut an impressive figure as it and others like it trawled the lake in search of red metal. Map of Calumet & Hecla smelting and mill works. Notice the immense spread of stamp sand created near the Hecla Mill (right). for company stamp mills. Copper, of course, does not come out of the ground already processed and molded into shining ingots; it is largely piecemeal, lodged in larger chunks of poor rock from which it must be removed. With steam-powered machines fueled by the abundant waters of Torch Lake, stamp mills crushed that rock into small pieces and sorted the usable copper from it. The sizable pieces of poor rock could be preserved for use in construction of roads or buildings. In the years before about 1910, however, the smallest fragments (tailings) offered little value to companies like Quincy and Calumet & Hecla. For the sake of convenience and cost, they dumped this waste material virtually wholesale into the adjacent lake. The mining companies, however, kept an eye on and indeed played an important role in the development of innovative technologies that could improve their efficiency and maximize their profits. In the dawn of the twentieth century, however, new processes and devices offered the Copper Country’s bigger players a chance to turn their trash into cash. In March 1913, C&H chief metallurgist C. Harry Benedict received a patent for a procedure that would use ammonia solutions to “leach,” or drain, native copper from the rock containing it. We’ll skip the technical details for now, but interested readers might enjoy a description published in the professional Mining Journal in 1915. The sophisticated and yet logical system suddenly opened up possibilities for what historian Larry Lankton estimated as 152 acres of C&H tailings dumped in Torch Lake. Rather than waste, they were brimming with copper ready to be reclaimed. The dredge that arrived to begin the reclamation process in about 1915 was the handiwork of South Milwaukee’s Bucyrus-Erie Company, and, according to one Daily Mining Gazette article, weighed some 1150 tons. A second dredge, also with a hull and machine by Bucyrus, arrived in 1924; the company appears to have owned a third only briefly. Until the 1950s, the dredges did exactly what C&H had hoped, scooping up over 50 million tons of Torch Lake tailings that produced 423 million pounds of copper. 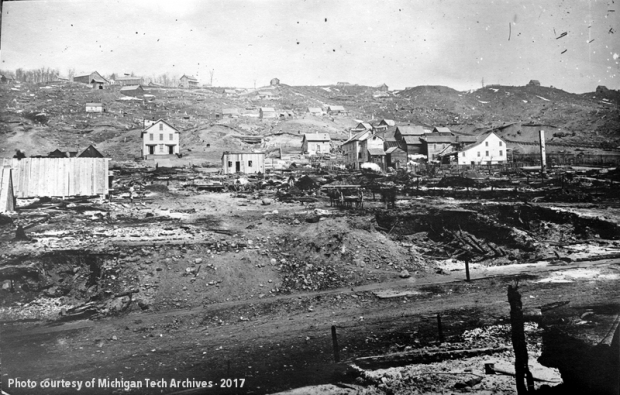 Men from the mill towns of Hubbell, Lake Linden, and other settlements in particular found employment in the C&H reclamation division, which pioneer Benedict–in a remark that may seem somewhat self-aggrandizing–credited as preventing the complete collapse of the Copper Country when prices for the mineral fell in the wake of World War I. The Quincy Mining Company also got into the reclamation game, but their dredge purchases came much later. Buck Construction in Superior built the house of their first dredge; Bucyrus provided the hull and machinery. Quincy Dredge #1 began its work in about 1943 and sank unceremoniously into the lake on January 15, 1956. It remains there, hidden under the gently lapping waters, to this day. This sinking, however, did not put Quincy out of the reclamation business. Shortly before, C&H had sold its original dredge to the competition. According to the Gazette, Quincy operated this grand old vessel until 1967, when its work was over, and it collapsed, exhausted, on the stamp sand beach. Thus ended the era of copper reclamation on Torch Lake, and so began the slow decay of an icon. Today, it bears the rust and rot marks of time and the scars left by visitors. 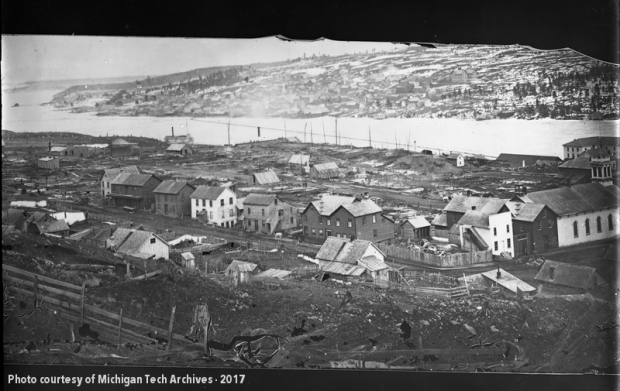 In spite of its infirmities, the dredge offers a fascinating testament to the ingenuity and scientific advance of the copper mines and the industrial heyday of the Keweenaw Peninsula. 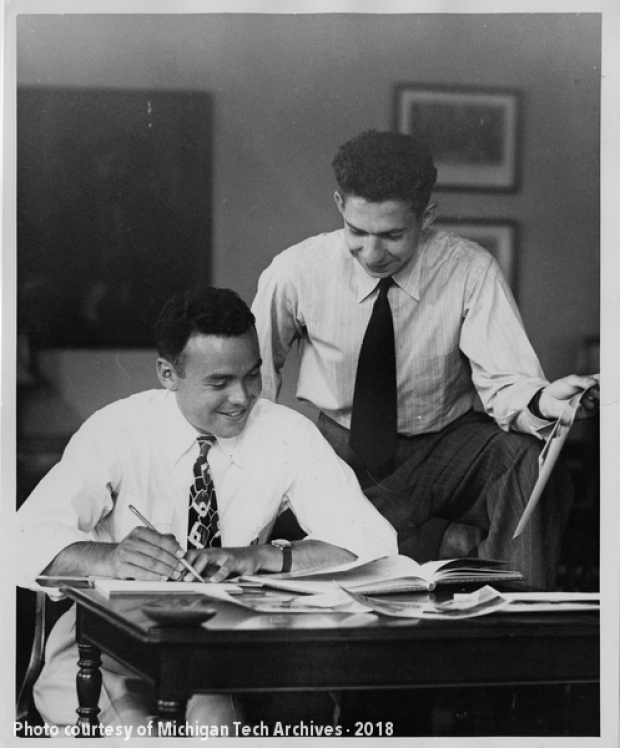 The Michigan Technological University Archives and Copper Country Historical Collections, a department within the J. Robert Van Pelt and John and Ruanne Opie Library at Michigan Technological University, is currently seeking applicants for the Friends of the Michigan Tech Library Graduate Archives Internship for summer 2019. The archives provides a high level of service to scholars, students and a wide range of walk-in visitors and global patrons through virtual reference. Summer services are fast-paced and we see an increase in visitors, especially through our role as part of the Keweenaw Heritage Site network, a partnership with the Keweenaw National Historical Park. Areas of emphasis include manuscripts, maps, print and digital images which document the Keweenaw Peninsula, Michigan’s Western Upper Peninsula (U.P.) and university history. The intern selected will receive experience in both public service and collections handling. The intern will assist in day-to-day reference activities, including greeting and assisting researchers, retrieving and shelving collections, and assisting university and community patrons with use of materials and equipment. 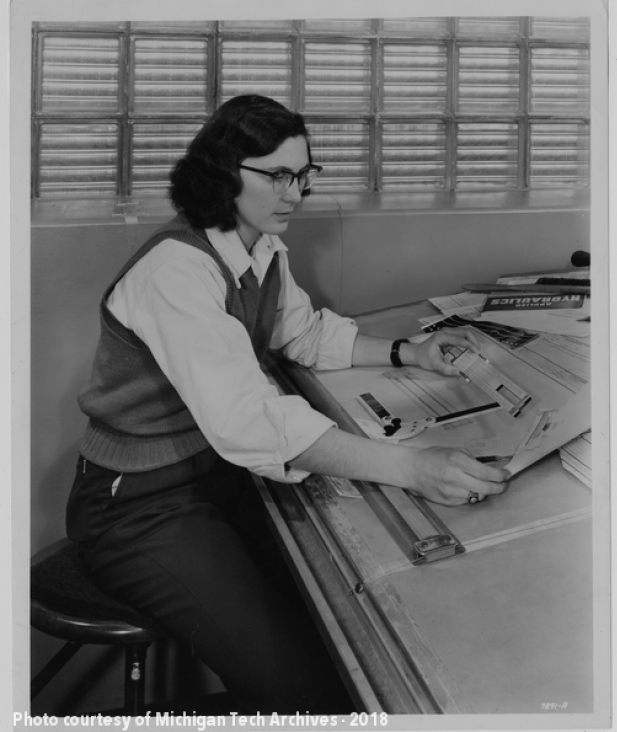 The intern will also gain experience in organizing, describing, and processing archival collections. Knowledge of contemporary archival practices, policies and procedures, including arrangement and description, and familiarity with DACS, MARC, LCSH, Dublin Core, and MPLP. Ability to work independently and exercise initiative, discretion, and judgment. Ability to work collegially and effectively in a team-based environment. This is a 35 hour per week, part-time summer position intended to span seven weeks. The preferred start date is July 1. There are no benefits included with this position and the successful candidate will be expected to cover travel expenses to Houghton, Michigan. The intern will be compensated for actual work performed in the form of a stipend up to $5,000, to be paid out bi-weekly throughout the duration of employment. Offers of employment are contingent upon and not considered finalized until the required background check has been performed and the results received and assessed. Housing options in the Copper Country include independently requesting a single occupancy dorm room and included meal plan (depending on availability) or making off-campus housing arrangements. In addition to a great working environment you will enjoy exquisite scenery, moderate temperatures, and outdoor activities near the shores of Lake Superior! Tony Esposito with the NCAA Trophy, March 1965. 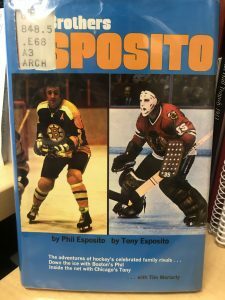 The National Hockey League (NHL) Stanley Cup Playoffs are just around the corner, so for Flashback Friday it seems appropriate to fondly remember one of the most recognizable NHL faces connected to Michigan Tech hockey; Tony Esposito! 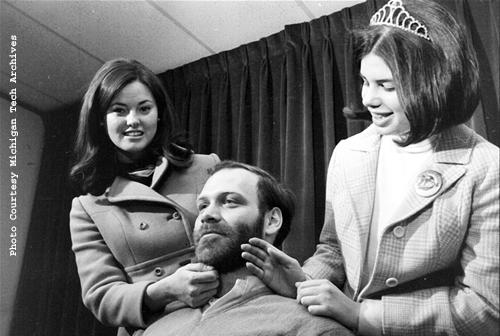 This photograph appeared in the Daily Mining Gazette on Monday, March 22, 1965. 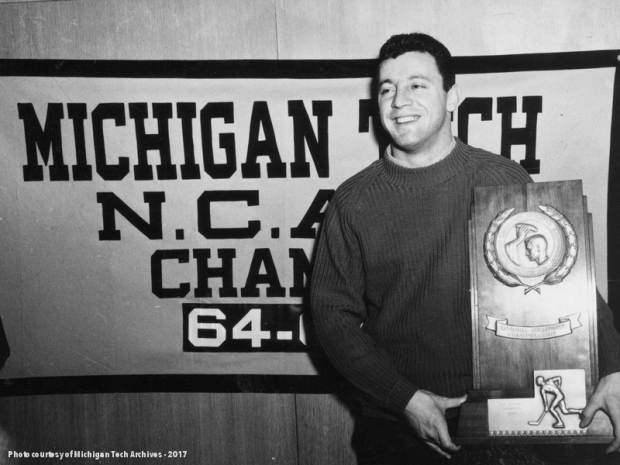 The image depicts Tony holding the NCAA hockey championship trophy. Esposito tended goal for the Huskies that season and held Boston College to only two goals in the 8-2 championship final. 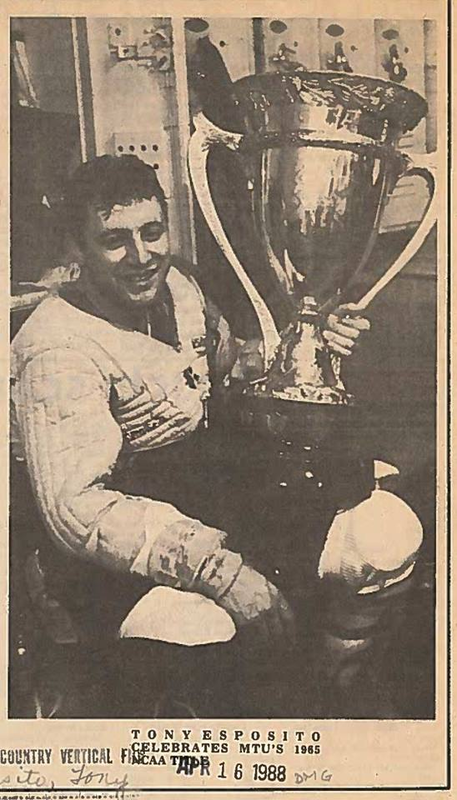 Tony Esposito celebrates in 1965. The game ended in a 2-2 tie. Phil scored both goals for Boston, which Tony recalls as being “lucky shots” which he “should have gotten glove on,” but at least he was able to hold his brother to only the two goals. It is important to mention, Tony made an impressive 33 saves in his first NHL start. 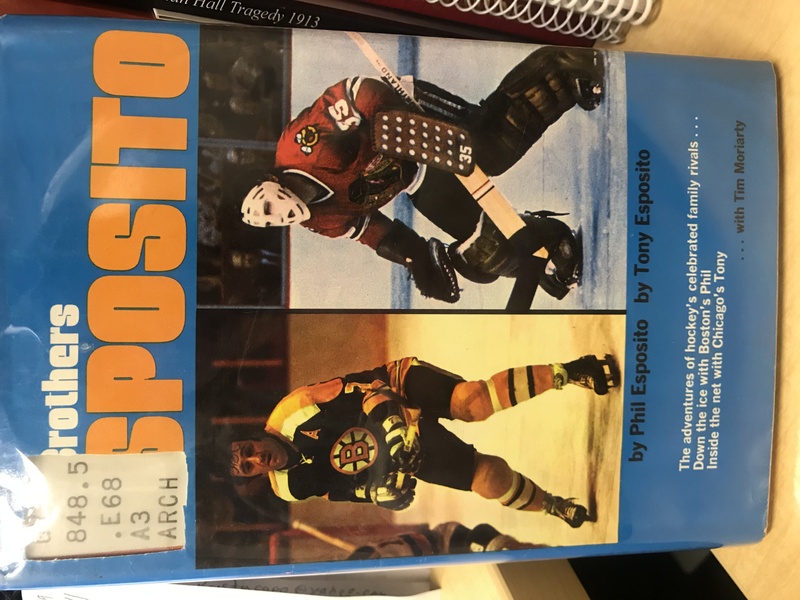 The Brother Esposito by Phil and Tony Esposito. This book is available in the Michigan Tech Archives. Not since their street hockey days back in Sault Ste. Marie, Canada had the brothers found themselves on opposing teams. To say the least, it was a historic moment, and one that adds the necessary dose of drama that makes for good hockey stories and sets the foundation for legend-status. Both brothers have been inducted into the Hockey Hall of Fame and have been named on the 100 Greatest NHL Players’ in history list. Tony’s run with the Habs lasted for only one season and he would go on to join the Chicago Blackhawks off waivers for the 1969-1970 season. He put up a phenomenal season, recording record-breaking shutouts and winning a lot of league accolades, including the Calder Memorial Trophy and the Vezina Trophy. This is the year that earned him the nickname Tony ‘O’ for his shutout skills. Esposito remained with Chicago the duration of his on-ice career, making it to the Big Show several times. However, the Stanley Cup alluded him. But clearly, not all legends get to hoist the Cup. Every now and then, there is a good Tony ‘O’ story that comes across us in the archives. To us, he will always special, and yes, always a Husky! 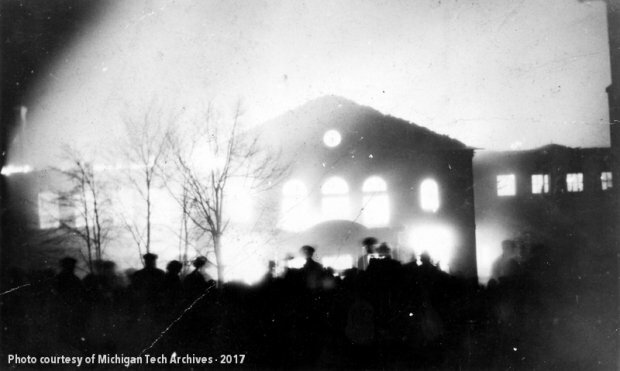 The Metallurgy Building on fire, March 15, 1923. For this week’s Flashback Friday we’re remembering how quickly change can happen overnight, sometimes when you least expect it. 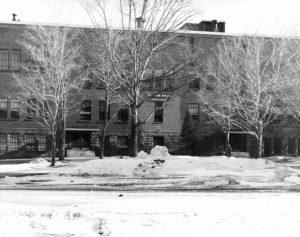 The early 20th century Michigan Tech campus looked vastly different than it does today, not only in terms of the courses and degrees it offers, but its physical landscape. Many of the earliest buildings on campus are gone, lost to changes in the needs of the university or unexpectedly by disaster. 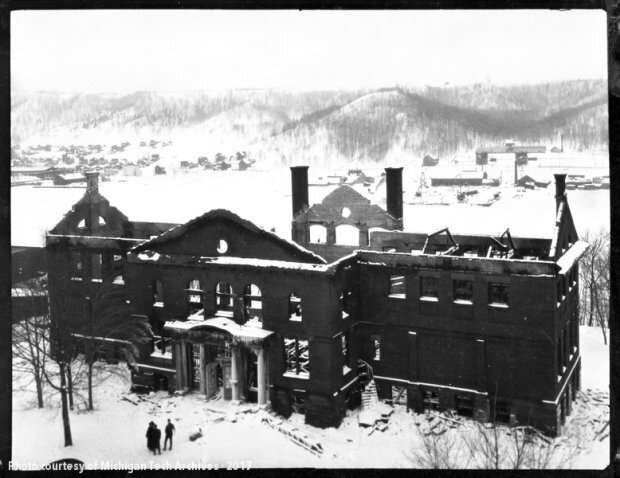 Today marks the 96 anniversary of the fire that destroyed one such building. Metallurgical building at the Michigan College of Mines. Metallurgy building after the fire, 1923. 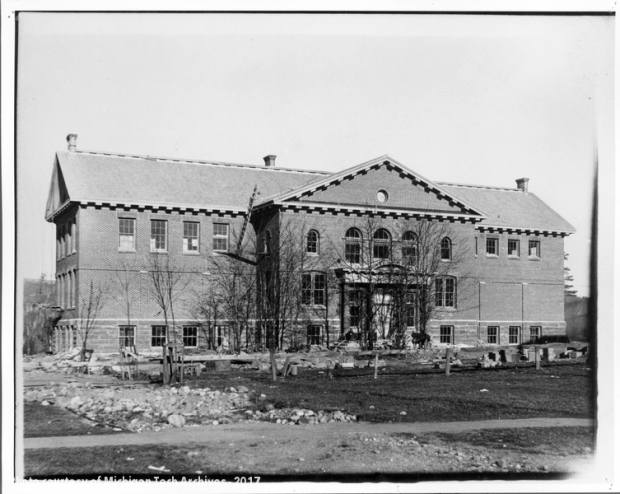 However, by September 1923, the Alumnus reported that plans for rebuilding the metallurgy building were underway and by January 1925 the publication was asking alumni to weigh in on a name for the new structure. 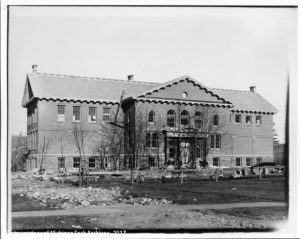 The new metallurgy building opened for students, faculty, and staff later that year and christened McNair Hall, the college’s former president who died tragically in an accident in 1924. 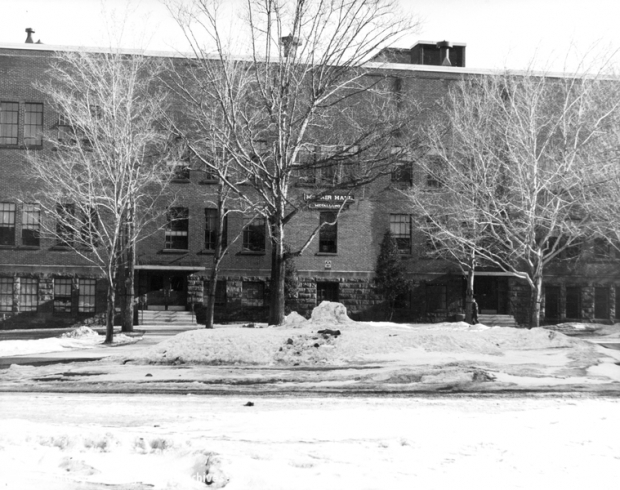 While this building bears the same name as a current resident hall at Michigan Tech, these were two distinct buildings. McNair Hall. This building replaced the Metallurgy Building. Regardless of which building it has occupied, since the establishment of the Michigan Mining School in 1885, metallurgy in one shape or form has been integral to this campus. It has evolved from mineral dressing to metallurgy, to metallurgical engineering, to metallurgical and materials engineering, before finally becoming the Department of Materials Science and Engineering in 2000. 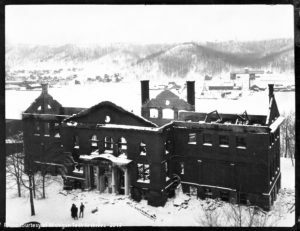 Building disasters and failures like the one at the metallurgy building show how change can happen in a blink of an eye. Luckily no one was harmed and rebuilding happened in its wake. It’s a reminder that our landscapes can change quickly, that they aren’t always able to be thoughtfully planned, but even with unexpected change this campus and community continues to grow and evolve. Mamie Nelson of Hancock celebrating her 123rd birthday. On February 3, 1948, Mamie Nelson celebrated her 123rd birthday. For the occasion, she donned a black dress that matched the fashions of an older era and made the journey from her residence at the Houghton County Infirmary down to a photographer’s studio. There, no doubt with great care, she settled into a chair before a painted arbor backdrop and fixed her rheumy gaze upon the camera. One eyelid no longer seemed to open; the other did so after a valiant struggle, revealing a blind eye. She mustered the best smile that age allowed her and made sure her close-cropped white hair had been tucked neatly behind her ears. On a carved stand next to her, someone placed a birthday cake, elegantly scalloped with white frosting for the big day. With the click of a shutter, Mamie Nelson’s birthday entered history. Locally, at least. If it seems unlikely that a person could live more than 120 years and remain so unknown to the world, it should. 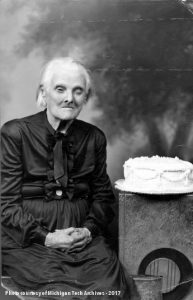 Mamie might have celebrated the 123rd anniversary of her birth, but that didn’t mean that she had actually reached such an age. Somewhere along the line, it appears that Mamie started to age more than one year at a time. So, who was this woman who claimed to be a supercentenarian? What was her story? According to an obituary published in the Daily Mining Gazette–summarizing information that Mamie had offered in a number of interviews–the aged Mrs. Nelson was born in Ireland in 1825. At that time, the writer noted, “James Monroe, fifth president of the United States, was completing the last year of the second term of his administration… the king of the British realm at that time was George IV, son of the king who lost the American colonies.” Mamie described an impressive and interesting childhood. She attested that she had seen Queen Victoria in person on at least one occasion. This was the least of the wonderful sights, however. “Her father was the master of a sailing vessel engaged in trade between England, China, Japan and India,” the Gazette said in her obituary, “and as a girl Mrs. Nelson made many voyages with her father to the land of the Far East.” In total, she would claim a total of 32 transatlantic voyages. The circumstances that had brought this supposed globe trotter across the Atlantic one last time went unexplained. At some point after her arrival in the United States, according to Hidden Gems and Towering Tales: A Hancock, Michigan Anthology, Mamie said that she resided in Illinois; she moved to the Copper Country in 1863. She described vivid memories of Abraham Lincoln’s inauguration in 1861 and his tragic assassination in 1865; she told of the horrors of the great Hancock fire of 1869 and the loss of the Lake Linden home that she shared with her husband, Carl, to a similar blaze in 1887. Later, the Nelsons operated a pasty bakery out of a residence in Hancock. 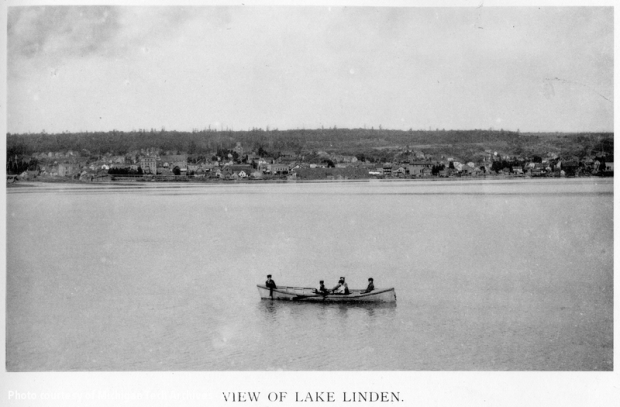 Lake Linden in 1898, around the time Mamie and her husband Carl resided there. As best as we can tell, these tales mix strict truth with colorful exaggeration or misunderstanding. Archival evidence about Mamie is scanty at best and often contradictory. She never deviated in declaring her Irish birth; this may have been a point of pride for her. She was listed in the 1910 federal census at 303 Quincy Street in Hancock, providing her age as 80 and her year of immigration as 1831. By 1920, she had aged to 94, with an immigration year of 1826. These appear to be the earliest instances of Mamie professing an exceptional age. In contrast, when the census taker came in 1900, he found Mamie (listed as Mary) and Carl Nellson [sic] living in Torch Lake Township near Lake Linden. In those days, Mamie gave her year of birth as a more modest 1855 and her year of arrival in the United States as 1856. This would have made her some 93 years old in 1948–a venerable number, to be sure, but not a record-breaking one. If Mamie was indeed born in 1855, her true age did not preclude her incredible stories from being true. She would have been six when Lincoln was inaugurated and ten when he died; if she lived in Hancock, she would have experienced the great fire at fourteen years old. Such tremendous events as these stick in the minds of even small children and certainly in those of teenagers. Ask someone who was young when Pearl Harbor was bombed, Kennedy was assassinated, or 9/11 occurred about those times, and the memories come back as clearly as yesterday. And perhaps Mamie’s father really was a ship’s captain who voyaged around the world, taking his daughter with him. Crossing the Atlantic nearly three dozen times was no less a feat if the journey started in the United States than if it started in Ireland. Maybe she truly did see Japan and India, and the wonders of these worlds inspired in her a new appreciation for her tight-knit Keweenaw communities. On the other hand, maybe these stories grew from a colorful and vivid imagination, the result of Mamie’s daydreams as she rolled out pasty crust and chopped potatoes. We may never know how Mamie Nelson spent her early days, how old she truly was, or what led her to believe or claim that she was 123 years old. One declaration may be made with certainty, however: whether the tales she told came from reality or from inside her head, this Copper Country woman lived an exceptionally interesting life. Got snow? It certainly has been a snowy month here in the Copper Country and it looks like we’re in for another round this weekend. 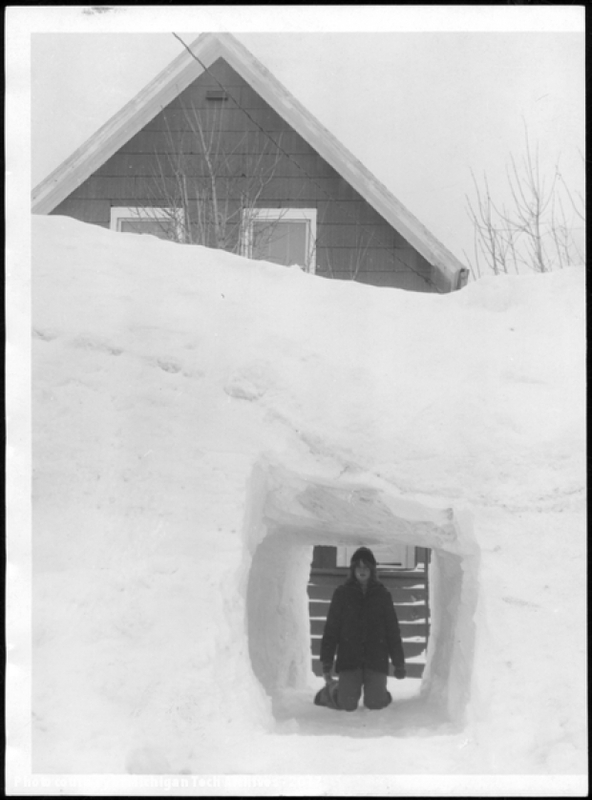 While some folks might be griping about all the white stuff, in the Copper Country we make the most of it, which is why we’re featuring this February 1976 photo from the Daily Mining Gazette for this week’s Flashback Friday. Sometimes there truly is no getting around winter in this area, so what do you do? Just what Calumet native Joseph Meneguzzo, Jr. did at his home at 2042 Calumet Avenue–you go through it! Joseph’s neighbor, Julie Rauch, pictured here, shows off the impressive 15-foot tunnel the ingenious youngster made from the front steps to the road. While the tunnel seems to have been ideal for toddlers, not adults, it certainly shows the tenacity and creativity of most Copper Country youths. If you’re looking for inspiration for what to do with all that snow in your front yard, look no further! 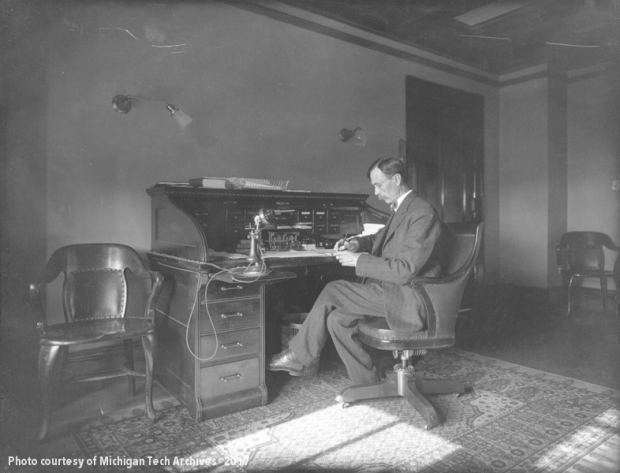 A photo of the photographer J. T. Reeder at his desk in the Calumet & Hecla offices, date unknown. 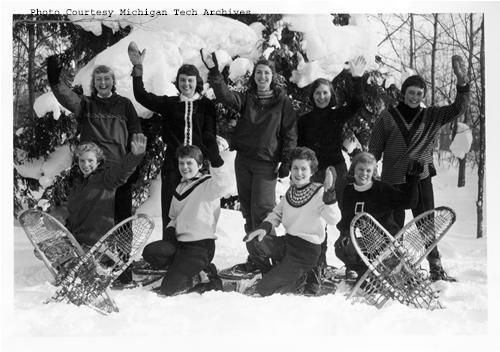 The Michigan Technological University Archives and Copper Country Historical Collections, a department within the J. Robert Van Pelt and John and Ruanne Opie Library, is currently accepting applications for its annual Travel Grant Program, which brings scholars and researchers to Michigan Technological University to work with the archives’ collections. 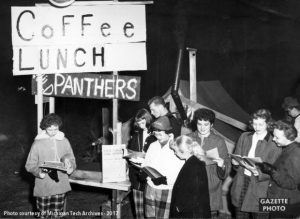 Financial support for the Travel Grant Program is provided by the Friends of the Michigan Tech Library, a support organization for the Van Pelt and Opie Library. Grants are awarded for up to $750 to defray the costs of travel to visit and conduct research in Houghton, Michigan. In addition, graduate students applying to the program may request up to an additional $200 to help defray any duplication costs incurred during a qualified research trip. The Michigan Tech Archives houses a wide variety of historical print, graphic and manuscript resources related to the Copper Country and Michigan Technological University. 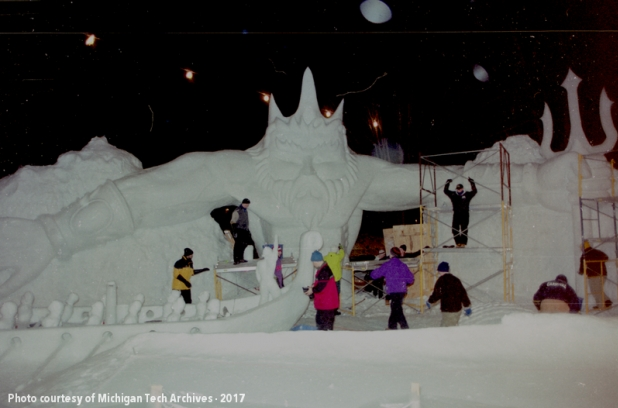 Subject coverage is vast, some of which includes university and campus life, regional towns and cities, local industries and businesses, social organizations, events and personalities of the Copper Country and Michigan’s Upper Peninsula. Primary topical research areas include the western Upper Peninsula, industrial history, particularly copper mining and its ancillary industries, social history, community development along the Keweenaw Peninsula, transportation and the environment. Finding aids for some of the collections can be found here: http://www.mtu.edu/library/archives/collections/. Applications are due on March 29, 2019. Award recipients will be notified by late April or early May. The successful candidate must complete their travel by December 6, 2019. Electronic submission of applications is required.